If you've ever had the opportunity to visit Sedona, Arizona then you know what magical, beautiful place it is. There are so many amazing outdoor adventure opportunities, including some of the best trails for Arizona hiking! There are limitless opportunities for great hiking in Sedona, so I've pulled together a list with 10 of the best Sedona hikes to help you know where to start! You really can't go wrong with any of these best hiking trails in Sedona below, and you are certain to fall in love with with this place and it's mesmerizing Red Rock features once you visit! We will go into details of the 10 best hikes in Sedona below, and if you are interested in more guides for hiking in Arizona, be sure to check out our resources at the bottom of the post. We include links to some classic hikes in Arizona include a complete guide to hiking Havasu Falls (+ an essential Havasu Falls backpacking gear list) and a trail guide to hiking Arizona's tallest peak, Humphreys Peak! Many of the best Sedona hiking trails are located only a short distance from the center of Sedona. Some of the trails will be very popular and often crowded (the price you pay for easy, accessible beautiful hiking trails), but some of the trails afford you a bit more solitude in the wilderness area surrounding Sedona. Our list of top hikes in Sedona below has a bit of everything, including a trail that is a bit more like rock scrambling than true hiking! Below is a map showing the location of each of the Sedona trails discussed below. So without further ado, here are 10 of the best Sedona hikes to ignite your next Sedona Arizona hiking adventure! If you are looking for a trail with epic views of Sedona, then you should put the Devil's Bridge hike high on your must-hike list! According to USDA Forest Service it is the largest natural sandstone arch in the Sedona area. Your hike can start from one or two parking areas. If you have a higher clearance vehicle, you will be able to drive down Dry Creek Road (FR 152) to the trailhead which will make your total hike mileage around 2 miles roundtrip. However, if you are uncertain your car can make the clearance, opt to park at the Mescal Trailhead on Long Canyon Road and hike from Mescal to Chuckwagon to Devils Bridge for about 4 miles roundtrip. The trail is relatively easy to follow, and you'll find the path starts out rather easy, but eventually you will start to gain a bit of uphill on your hike towards Devil's Bridge. Follow the trail markers that point the way from the parking area. At about 3/4 of a mile from the parking area you will hit your first fork in the trail. Taking the left fork will lead you toward the base of the bridge, where you can look up and see the bridge standing tall above you. The right fork, however, will lead you up a natural rock staircase to the bridge itself, and if you're brave enough you can even hike onto the top of the bridge. It's a fairly wide bridge, but make sure to be careful and exercise caution because a fall here would be dangerous. Pro Tip: Since this trail is one of the best places to hike in Sedona and offer's great views of Sedona, it is a very popular trail. If you are looking for quiet and solitude from your hike you may want to reconsider hiking this trail. However for best attempts at solitude consider doing this one early in the morning, on a weekday, or later in the evening. Also note, that this area is flagged as a "No Drone Zone", so leave the drones at home for this one. The iconic Bell Rock formation is named after it's unique "bell-like" shape, and is a great family friendly easy hike in Sedona. While there are many ways to enjoy this area (including hiking up the Bell Rock formation) most tend to hike along the Bell Rock Pathway Trail. The Bell rock pathway trail links up the Bell Rock Vista Trail head to the Little Horse Trailhead for a total of about 3.6 miles (out and back style). Hiking this trail affords you amazing views of not only Bell Rock, but also Courthouse Butte and other notable landmarks in the area. The pathway trail is generally easy going and a flat trail, but there are some rocky areas and areas with hills. Hiking to the west side of Bell Rock will give you great views of the rock that you cannot get from the highway. Pro Tip: Relative to other hikes in the area, this is one of the easy hikes in Sedona. It is great for kids and families, and dogs are even welcome on the trail as long as they are on leash. If you want to attempt hiking up Bell Rock formation, follow the signs that say "Bell Rock Climb", at your own risk of course as many parts of the Bell Rock climb could be considered class-3 hiking and is much more strenuous than the Bell Rock Pathway. The Soldier Pass Trail provides a diverse hiking experience through the Red Rock Secret Mountain Wilderness area, displaying beautiful red rock features along the whole hike and ultimately leading to scenic views of Sedona and red cliffs in the wilderness. The trail is about a total distance of 4.5 miles roundtrip and is a moderate hike. Parts of the trail are gradual, but as you get closer to the pass the trail will become steeper and more rocky until it ultimately levels out with panoramic views. At the beginning of the trail it can be a pretty popular area, so be prepared to share the trail with many hikers and Jeep tours and off-road vehicles in the area. Starting your hike at the trailhead, you will follow the trail toward the Devil’s Kitchen sinkhole, which is slightly off trail about 1/4 mile. As you continue on past Devil’s Kitchen Sinkhole you will hike for a bout another 1/4 mile past the “Seven Sacred Pools”, which will be on your left. You will continue on the Soldier Pass Trail, which intersects a off-road trail, and continue on until you reach a distinct fork in the trail marked by a wilderness area boundary sign. The main trail takes the left fork, and the right fork leads to an arch. Assuming you continue on the main trail, the trail will start to become a bit steeper and rockier until ultimately your hike flattens out on the Brins Mesa. Return back to the trailhead the same way you came up! Pro Tip: If you are looking for a longer hike, link up the Soldier Pass Trail with the Brins Mesa Trail! There are a lot of cool interlinking trails in the area! Also, parking can be a challenge in this area, so plan to come early or consider other areas for parking! The Cathedral Rock trail is a steeper but short hike that is very popular in the Sedona area. Despite its steep climb though, you will be rewarded with excellent views all along the trail. Be prepared to not always be following a trail, many portions of this trail require using your best judgement to follow the path of least resistance toward the top. However, there are ample places to climb, and you can watch others if you are uncertain of the best path to take. This hike is more like a fun scramble than a hike really, but that is what makes it fun! Be prepared to use your hands and your feet to hike this one! You’ll stay on the right path by following cairns from the trailhead and following the fairly obvious trail and staircases of steep rocks toward the top of the trail. Once the trail gets a bit rockier, there may be a point where you hesitate before deciding to continue on the steeper end of the trail. However, it is totally doable, just be smart and make use of the many hand and foot holds that lead toward the top of a “crevasse” feature. Please exercise caution at attempting this portion of the trail if it has recently rained. Continue onwards, scrambling up rock and climbing natural rock staircases as you make your way to the top, resting when you need to. When you get to the top you’ll see a sign that shows “End of the Trail” and that’s your queue to take in the beautiful views from the top! Return the same route you hiked to the top! Pro Tip: Parking can be challenging here since this is one of the best day hikes in Sedona, so try to get to the trail early if you can. This trail is also pretty exposed the whole way. There isn’t really any shade along the route. Bring plenty of sunscreen! This might not be the best hike to do if you are very afraid of heights, some rock-scrambling is involved. I don’t know about you, but I love a good canyon hiking trail, especially ones immersed in beautiful desert landscapes like Arizona and Utah (we recently hiked Utah’s gorgeous Kanarra Falls Trail which also has a beautiful canyon hike). Boynton canyon is one of those stunning canyon hikes, and it is also fairly convenient and accessible to get to from Sedona. Filled with not only beautiful desert landscape and scenery like tall, towering buttes and red-sandstone rock, but also forests with a variety of trees and plant-life. It is one of the most beautiful box canyons in Sedona! The trail is roughly 6 miles round trip, but it is worth the effort and most of the hiking is fairly easy going. Your hike will start out by a nearby resort, but will soon continue into the canyon where you will hike among the varied and beautiful desert environment. You will transition from forest to desert landscape throughout the hike, so be sure to take note of all the different plants and trees around you! Be prepared to spend about 3-4 hours hiking the trail if you tend to go all the way to the end of the trail (which we recommend!). Pro Tip: Since the trail is a bit more accessible than others (think: no long bumpy off roads), there may be more of a crowd at this hike. You’ll do best to get here early, and/or hike on the weekdays. Total Milage: ~1.4-2.6 miles round trip (depending on how much you hike around the mesa once you get to the top. It’s only about 0.7 miles to the top of the mesa). Doe Mountain has that iconic Mesa-shape that you see throughout the state of Arizona, and is another easily accessible trail from Sedona. It’s a quick hike with a bit of elevation gain, but your efforts toward the top of the mesa will award you with top-notch Sedona views. Easy to get to, great views, a easy day hike, with less crowds than some of the other popular Sedona hikes, Doe Mountain trail should be at the top of your list! You’ll start your hike switchbacking up the main trail toward the top of the flat-top-mesa of Doe Mountain. It’s a short and moderate hike to the top where you have ample room to enjoy the view, and for the best views continue following the cairns to the other side of the mesa. From the top you can look out and see a lot of different icon Sedona features, including Bear and Wilson Mountain, Chimney Rock, and even Sedona itself. Pro Tip: Since this trail is fairly straight forward, and is shorter, consider doing this hike around sunset so that you can get those epic desert Arizona sunsets combined with top-notch views of Sedona. Just be mindful of your hike back. Watch your step (you don’t want to hike off the side of the mesa) and bring a headlamp! Unlike some of the other hikes in this list, the Bear Mountain Trail is a more strenuous hike and you should make sure to assess your physical fitness before attempting the trail. The trail is mostly unshaded (read: do this one when the temps are cooler and wear plenty of sunscreen) and gains over 1800 feet toward the top of Bear Mountain summit. Starting at the parking lot, you will make your way for roughly 2.3 miles toward Bear Mountain. When you are at the base of Bear Mountain the trail will become more narrow and you will begin your steep mach to the summit, hiking up a series of rocky switchbacks. Eventually those switchbacks will level out (but only for a bit) until ultimately you begin your climb again up another steep and rocky side canyon. When the trail becomes faint, keep an eye out for white painted diamond shapes on the rock to direct you to the correct path. This trail is full of its share of “false summits” (when you think you are almost there, but you aren’t), but keep fighting the good fight, because once you do finally reach the true Bear Mountain summit you will be rewarded with panoramic views of the Sedona Wilderness. Expect this hike to take you anywhere from 4-6 hours roundtrip. Pro Tip: If you don’t feel up to the entire hike too the summit of Bear Mountain, you could still hike portions of this trail and turn around at the mileage you’re comfortable with. This trail is gorgeous and has great views along the whole trail, so it is still an excellent choice for hiking in Sedona. Merry-go-round rock is the setting for some epic Sedona views and is often a coveted spot for couple's engagement and wedding photos. There are 2 primary ways to access Merry-Go-Round Rock. One option is a 2 mile round trip trail via Schnebly Hill Road, but accessing this road can prove difficult and it is recommended that you have a 4WD high clearance off-road vehicle to get to the trailhead. The other option for hiking to Merry-Go-Rouond Rock is via Munds Wagon Trail which requires a bit longer of a hike, but is much more accessible to get to. If you opt to hike the trail via Muds Wagon Trail, you will hike about 8 miles round trip and climb roughly 1,200 feet of total elevation gain. This main trail intersects a dirt road from time to time, and some find it easier to hike up the dirt road and back down via the trail. Even though there is roughly 1,200 feet of climbing involved, it ascends gradually on a well maintained and well marked trail and takes you by two popular rock formations. One of those formations is called Cow Pies and is a short distance off trail, and the other is the Merry-Go-Round Rock (aka Carousel Rock). When you get to Merry-Go-Round Rock you are afforded with amazing panoramic views of Bear Wallow Canyon and Munds Mountain. Pro Tip: Due to the trails gradual uphill climb, this area is also a popular mountain biking trail. Just be aware that this trail is mostly unshaded and can get very warm in the summer. Plan accordingly. The West Fork Trail is probably one of the most popular Sedona trails, and one of the biggest reasons why is because the trail has something to offer hikers year-round during every season. Even hiking here in the summer months can be pleasant as you will find shade next to the tall canyon walls and hiking along the nearby stream. In fact, there are around 12 fun creek crossing in this hike. The West Fork Trail is one of the easier hikes on this list and offers fun for every level of hiker and is great for families. Even though you will be creek crossing from time to time, the water is only a couple inches deep. Just take your time, and if you own some water resistant shoes wear them (or opt to get your feet a little wet on this one). Generally, the water can be avoided by stepping over stepping stones along the creek. The trail is easy to follow and well maintained up to the first 3 miles, however, you can also choose to explore further along the trail, just be aware that it will not be as well maintained or marked. Mornings and weekdays will be the least crowded times to explore this popular Sedona hike. Permit Required for Day Hiking? You must display a daily Red Rock Pass ($5) or show your Annual National Parks pass. The Wilson Canyon Trail is another easier, short hikes in Sedona and starts at the iconic Midgley Bridge. There are actually a lot of trails in this area, so if you finish this trail and want some more, connect up to another one of the area's trail after your Wilson Canyon Trail hike. The Wilson Canyon Trail is also a great trail to do in the summer due to its shorter distance and abundance in shade. Like most of the the hiking trails in Sedona, the Wilson Canyon trail features more beautiful red rock scenery and is only a short distance from a creek where you can cool down during the summer months. The hike itself is leisurely and has minimal elevation gain. The trail is well marked and well-shaded, perfect for the family and hikers of all age-groups. Pro Tip: As with many easily accessible trails, this area fills up fast and parking can be hard to get. Make sure to get here early and start your hike before the crowd! looking for more arizona adventures? So how many of the hikes above have you done? Are any of these still on your hiking bucket list?! 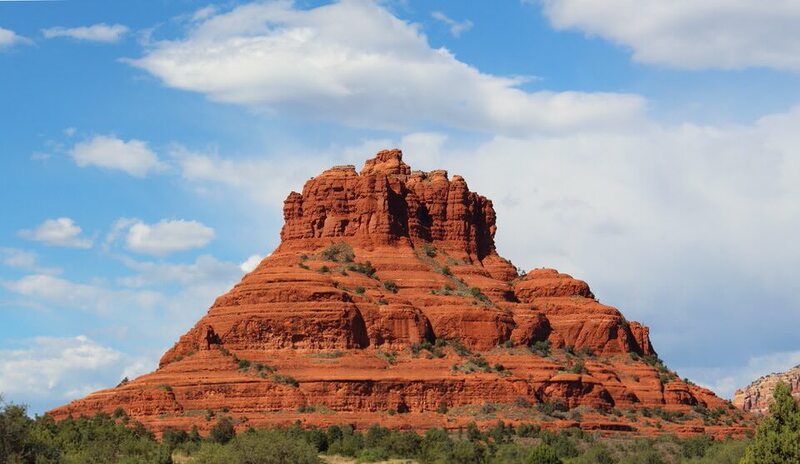 Did we miss any of your favorite Sedona hikes? Let us know in the comments below!